From time to time it happens that bug reports get pretty much nasty. A single user or some users request a feature. If you argue, bashing starts. The plugin shows the same entries as the “Documents” tool view on the left. With drag&drop, the tabs can be moved around. In KDE SC <= 4.6.2 this plugin is called Tabify. 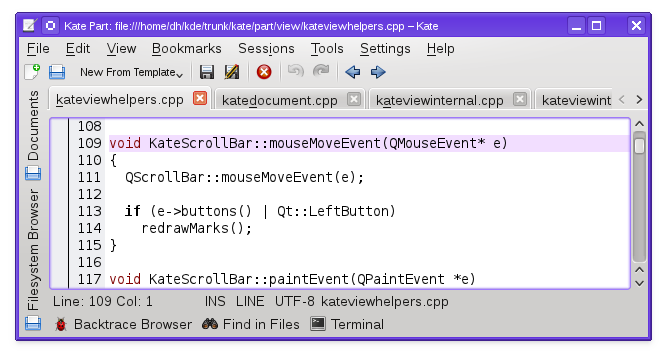 In KDE SC >= 4.6.3 the name is simply “Tab Bar”. As can be seen, this tab bar can be configured to span multiple lines in order to show more documents at the same time. Further, there are features like tab highlighting so that a document can quickly be found when working on a huge list of documents. There are more options in the configure dialog of this plugin (click small configure button on the right). 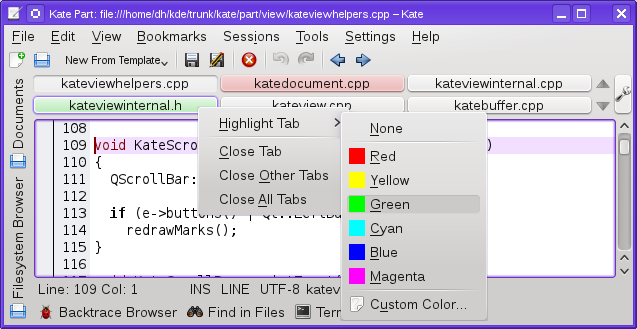 In KDE 4.7, it is possible to change to highlight a tab by clicking on it with the middle mouse button and clear the highlight with CTRL+middle-click. There have been requests to remove the non-standard plugin from Kate and just provide the standard conform Tabify plugin. I was about to do that, but then, we do have users that use the multiline tab bar. And as it works well and provides some features the default tab bar does not have, I’ve finally decided to keep it.